In May of 2006, members of Far Away Creations were invited to assist with some shooting of the movie 'Fanboys' which should be released this September. The director wanted to populate the set with props and costumes as well as a couple familiar robots. 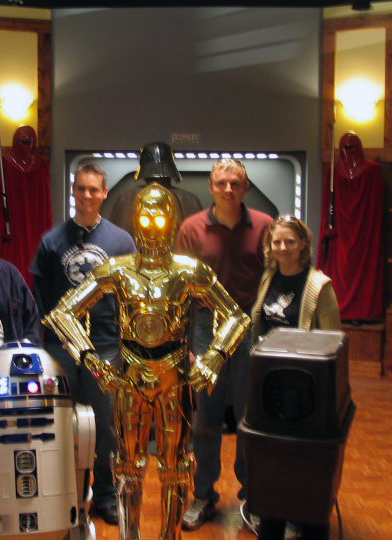 We were happy to assist and thanks to Hyperdyne Labs they were able to have a golden droid in the center of the set. It was a chore moving the droid around between takes. This little droid lost his head and had to be put in time out for bad behavior. We were told not to bring mannequins because they'd have plenty on hand. Well ... the selection was a little thin so we had to do some last minute improvising. That's o.k. it worked out fine but I think we used up most of their gaffer tape. Our gaffer tape royal guard mannequins seem to be holding up fine. With all the moving of the Vader display it also held up really well seing as it was simply a mannequin of 2x2's and a coat hanger for a hand to hold the saber. We had to think fast between takes to make the hand so our droid handler entertained the cast and crew along with Kevin Spacey with the remote control R2-D2 while we got the shot ready. Unfortunately a lot of the pictures came out a little fuzzy while at the Hotel. Far Away Creations' droid handler wanted to make sure the droid was working properly the night before the shoot and Director Kyle Newman and actors Sam Huntington and Dan Fogler enjoy some of R2's spotlight. I wonder if LFL's trash really does end up in a compactor like this? We couldn't resist playing around on the set at the end of the day. Cast and crew hanging around on set before it was ready for shooting. Actor Ray Park gets caught at a bad time munching on a power bar. I think he needed the energy to practice some of his moves in that costume. Here Ray starts to prepare for his scene. Ray works on his flips while actor Kevin Spacey and crew look on. Other members of the cast compliment Ray on his moves.